Crosby is pleased to announce another addition to its commercial team. 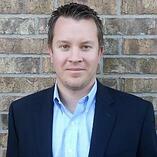 Ryan Clark has joined The Crosby Group as Director of Business Development for Oil and Gas. “We are excited to welcome Ryan to the Crosby team. Ryan’s wealth of experience from his roles at companies such as Oceaneering, Aker Solutions, and Oil States will build on Crosby’s long standing commitment to the Oil & Gas industry and our distributors that support it.” said Jared Knudson, President and Chief Executive Officer of Crosby. Ryan will be based in Houston, TX.